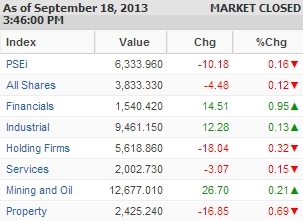 Manila—(PHStocks)—Philippine stocks take a breather on Wednesday, 18 September, as investors lock in their gains. The benchmark Philippine Stock Exchange index (PSEi) shed 10.18 points or just 0.16% to close today’s trading at 6,333.96 – maintaining its foothold at the 6,300 level. On sectoral basis, the Financials led the gainers, posting a 0.95% increase, while the Mining and Oil segment cut its downtrend to recover by 0.21% today. The Property index, on the other hand, led the losers, shedding 0.69%, while the Holding Firms sector dropped by 0.32%. Philippine National Bank (PNB) led the banks today, gaining 4.76%, followed by China Banking Corp. (CHIB), which increased by 4.35%. The property side was dragged down by Empire East Land Holdings Inc. (ELI), which lost 5.1%, and Philippine Estates Corp. (PHES), which declined by 3.23%. The wider All Shares index, however, just shed 0.12% or 4.48 points. Trading was slightly heavy today, with value turnover reaching Php8.38 billion on 1 billion shares traded. There were 70 gainers today versus 68 losers, while 42 stocks were flat. Today’s most active stocks by value include Ayala Land Inc. (ALI, PhP28.10, -0.53%), Alliance Global Group Inc. (AGI, PhP26.00, -2.99%), Philippine Long Distance Telephone Co. (TEL, PhP2,942.00, 0.07%), LT Group Inc. (LTG, PhP19.88, -0.50%), Metropolitan Bank & Trust Company (MBT, PhP85.50, 1.00%), SM Investments Corp. (SM, PhP785.00, -1.26%), Universal Robina Corp. (URC, PhP126.00, -0.71%), Security Bank Corp. (SECB, PhP126.30, 2.93%), Rizal Commercial Banking Corporation (PSE: RCB): PhP46.00, 2.91%), and Ayala Corp. (AC, PhP586.00, 1.03%).